34 Trinity - San Francisco. Radical newsstand, arts space and used bookstore. A Different Light - San Francisco. Alexander Book Co. - San Francisco. Arion Press - San Francisco. Limited edition books with original art. Aunt Lute Books - San Francisco. A non-profit corporation with a mission to print works of literature by women who have been traditionally under-represented in mainstream and small press publishing. Barnes and Noble - San Francisco. Bell's Books - Palo Alto. Bindery - San Francisco. 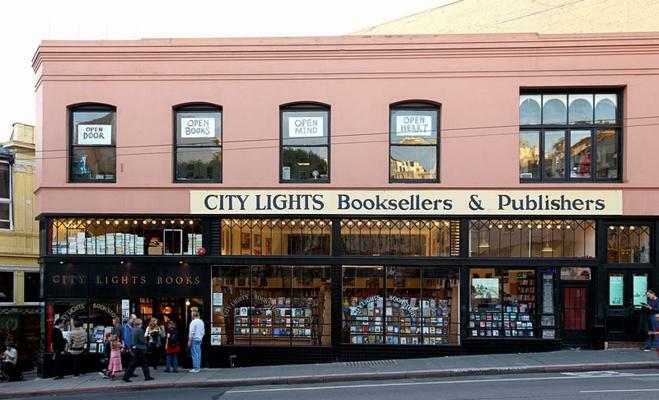 A multi-purpose events space and bookstore located at 1727 Haight Street. Bird and Beckett Books and Records - San Francisco. Black Oak Books - Berkeley. Bolerium Books - San Francisco. Book Passage - Corte Madera and San Francisco. Books, Inc. - Castro, Laural Village, Opera Plaza and Marina in San Francisco. BookShop West Portal - San Francisco. Browser Books - San Francisco. Fiction and literature, classic and contemporary. California International Antiquarian Book Fair - San Francisco. Christopher's Books - San Francisco. Chronicle Books - San Francisco. City Lights Booksellers - San Francisco. Landmark independent bookstore and publisher that specializes in world literature, the arts, and progressive politics. Comix Experience - San Francisco. Cover to Cover - San Francisco. Dog Eared Books - San Francisco. Ecology Center - Berkeley, California. European Book Company - San Francisco. Folio Book - San Francisco. Friends of the San Francisco Public Library - 391 Grove Street, San Francisco. G.F. Wilkinson Books - Hard to find, out of print, used, and rare books. Green Apple Bookstore - San Francisco. Also see Sell Us Your Books. Green Arcade, The - 1680 Market St. at Gough St., San Francisco. Specializing in books on San Francisco & California history, the built & the natural environment, politics & social justice, cooking, food & farming, select literature, noir, art, & children's books, mostly new, some used. Kepler's Books and Magazines - Menlo Park. KAYO Books - San Francisco. Laurel Bookstore - Oakland, California. Meyer Boswell Books Inc. - San Francisco. Browsable bookshop specializing in antiquarian law books. Searchable database of over 6,000 rare and scholarly books. Nolo Outlet Bookstore - Berkeley. Readers Bookstore, Fort Mason Center - San Francisco. Russian Hill Bookstore - San Francisco. Also see Selling your Books. San Francisco Camerawork Publications - San Francisco. San Francisco Center for the Book (SFCB) - San Francisco. Through workshops, exhibitions and public events, the SFCB promotes both knowledge of traditional book arts and exploration of experimental book forms. SFMOMA MuseumStore: Books + Media - San Francisco. Smoke Signals - Newspapers and magazines. Located at 2223 Polk Street (between Bonita St. & Vallejo St.). Socialist Action - San Francisco. Books and pamphlets. UCSF Medical Books - San Francisco. University Press Books - Berkeley. Vamp & Tramp, Booksellers - San Francisco. Wittenborn Art Books - San Francisco. Publisher and distributor new & antiquarian art reference books, bibliographies and iconographies; deluxe editions with original graphics of all periods; autographs; original prints and posters; ephemera. This webpage last updated on Saturday, October 20, 2018 8:44 AM.